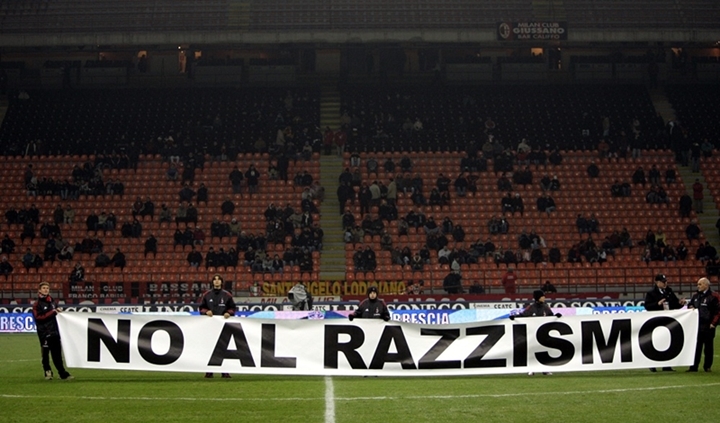 Italian football unites to spread a message of equality and to Show Racism the Red Card. After months of high profile incidents both on and off the pitch, Italian football clubs have vowed to step up the fight to tackle racism in the game with an open address to fans calling for an end to chanting that has blighted the reputation of Italian football. This weekend’s fixtures marked the ninth week of Action Against Racism; a nation-wide campaign supported by all clubs from Serie A, B, Lega Pro and the amateur divisions. The action also coincides with the forthcoming International Day for the Elimination of Racial Discrimination (21 March) organised by the United Nations. Ahead of every top flight game, club captains came together in the centre circle to read a specially prepared message imploring fans to end racist chanting at football matches. Ahead of the game between Roma and Palma, captains Francesco Totti and Alessandro Lucarelli showed large red cards towards the stand as part of the ‘Show Racism the Red Card’ campaign. Sadly, this hugely positive movement took place just days after Italian football was again thrown into the spotlight after fans of Inter Milan abused Tottenham Hotspur players including Emanuel Adebayor and Aaron Lennon during the sides 4-1 win in the Europa League. Spurs veteran goalkeeper Brad Friedel was on the pitch on Thursday night and believes that education is the answer to solving the much publicised problems within Italian football. Speaking to uefa.com, Friedel said “The attitude of the racists in Italy is the result of infrastructure and education,” he told uefa.com. Show Racism the Red Card are heartened to see such a proactive demonstration against the racism which has cast a showdow over Italian football over recent years and continues to condemn the actions of those who seek to champion hate and inequality.